Not quite a month since my last post....ugh! I really feel like I'm neglecting my blog. I was so darn excited about this blog when I started it, not quite one year ago...and now it is collecting dust. Hmmmm, reminds me of my treadmill (that thing is really neglected lately). Well...I am setting a goal right this very minute to blog once each week! It is something I really enjoy, and it makes me a better teacher....so I am going to carve out a bit more time to give to this guilty little pleasure of mine!! Recently, my third graders have begun working on responding to their reading by writing a bit about their thinking. Reading response is a very important component of reader's workshop for several reasons. First, it gives me a peek into the brains of my students, letting me know if my students are thinking about their reading and if so, what is the depth of their thinking. Second, when readers stop to think periodically as they read, and then jot their thoughts down on a sticky note, it automatically slows down the thinking process, allowing the reader to really reflect on the text in a more meaningful way. Finally, if you follow a reader's workshop model in your classroom, your students are meeting regularly at the end of workshop to "buzz" with a partner about their reading. When students stop, think and write as they are reading, they will have "talking points" all ready to go when they meet with their partner, which makes for a much more meaningful discussion. The trick to reading response is.....how to get your students started on it....and keep them going throughout the school year. I have found that the key is loads and loads of modeling!! When I read aloud to the kids (almost every day), I try to do what I want them to do: STOP, THINK AND JOT. Whether it's a picture book or a chapter book, I stop periodically, think outloud, and sometimes write down my thought on a sticky note. I think aloud about why I stopped where I did and what I am going to write down. Those are the things that they get stuck on: When, why and what to write on that sticky note. Modeling gives them a road map. I also give my students "When to Write a Sticky Note" page to keep in their reader's notebook. They use it a lot at first, but eventually get a feel for when to stop and jot without it! Sticky-noting plays an important role in responding to our reading....but the thinking and writing doesn't stop there. What to do with all of those sticky notes? My students save their sticky notes on a sticky note tracker (Thank you Beth Newingham! ), but that's not the end either! They keep their sticky note sheets in their reader's notebooks and at least once each week, they choose one of their sticky notes as a starting point for "stretching their thinking" even further. Aimee Buckner, in her book Notebook Connections, uses a strategy called "Finding the Spark" to help students to choose a sticky note that is worthy of stretching into a full-blown response. Once they choose this sticky note, they attach it to a piece of notebook paper (or into their response journal if they have one) and then write more about their thought. This process really pushes students to do all of the things we want them to do as readers: reflect on their reading and their thinking!! It is amazing to see their thinking path as they complete this type of response....you can see it develop onto the page!! My students turn-in their responses each week and I do my best to read all of them and write a short response. They love getting a personalized note from their teacher, and it motivates them to keep up with their responses, knowing that someone is actually reading what they wrote. They also share these responses with their reading partners when they meet, which we try to make time for almost every day. As we work on specific reading comprehension strategies, I will give students open-ended questions and/or prompts to guide their responses. I also frequently give students a response sheet or a thinkmark to fill-out and hand in. These are much more structured than the sticky note responses and offer a bit more accountability. They also give me convenient way to evaluate students on their reading comprehension skills and give them feedback for setting goals. Here are some response tools that I've recently created for guiding students in their responses (All three are common-core aligned). 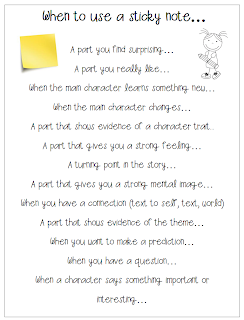 These are great for character analysis and include rubrics for giving feedback! 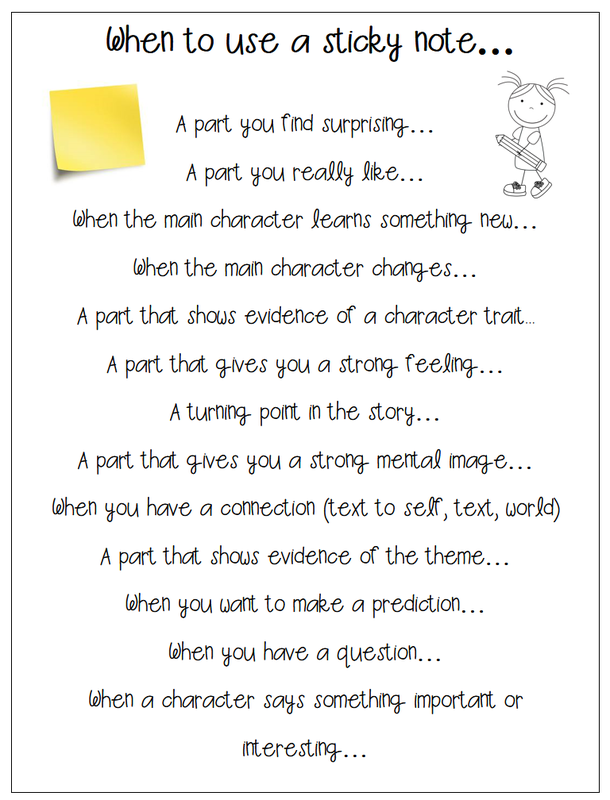 Great for fiction and non-fiction responses! Also have a rubric for giving feedback. 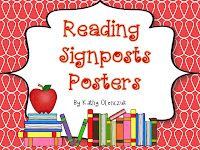 I would love to hear about how you use reading response in your classroom!! Thanks for popping in!! I LOVE the idea of the sticky note - thanks for sharing! Well, you certainly made up for your hiatus with a jam-packed full of idea post! Bookmarking so I can read and re-read! So many great ideas for sticky notes.